« Why we don’t set any vaccine bundle-package or promotion in our clinic? Sometimes it is difficult for foreign visitors to reach our clinic especially if they use taxi. It is true that we are under Mahidol University, however do not just call the taxi and let him drive to “Mahidol’s Travel Clinic” or “Mahidol’s Hospital”. It is very easy to get confused or even get lost. Why?? Here are some explanations and recommendation. 1. Mahidol University is a very big university. In Bangkok metropolitan alone, we have 3 different campuses in different part of Bangkok. So, let’s say, if you just say, “Go to Mahidol University”. The cab’s driver may not understand which campus. Moreover, in Mahidol University, we have 4 medical centers (Hospitals). So if you just say “To Mahidol’s Hospital”, you have to specify which one. 2. The most well known Mahidol University’s hospital is “Siriraj Hospital”. It is the biggest hospital not only in Thailand but in Southeast Asia also. Siriraj Hospital is located on the other side of ChaoPhaya River in Bangkok. So if the cab’s driver take you to Siriraj Hospital, it will take at least 1.5-2 hours to return to our hospital. 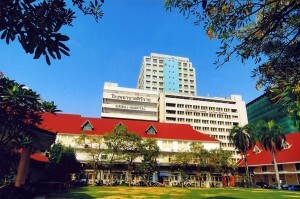 The second most well known, Mahidol University’s hospital is “Ramathibodi Hospital”. It is an excellent medical school as Siriraj. Fortunately, it is near our hospital. If you get lost and be there, it will take only 10-15 min back to our hospital. This is Siriraj Hospital, one of 4 Mahidol’s Hospital. 3. Our hospital, the Hospital for Tropical Diseases, is under the Faculty of Tropical Medicine. Practically, we are not really a standard medical school . 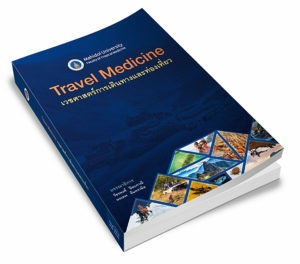 We are just a specilized medical center focus only on “Tropical Medicine” and “Travel Medicine”. We are less well-known than Siriraj Hospital or Ramathibodi Hospital. So it is likely that if you just say “Mahidol’s Hospital” the cab may not bring you here. 4. So if you plan to visit us by taxi, it is strongly recommend to print and show our Thai map to the driver. 5. Perhaps the most convenience and most easy way to reach our clinic is to use the BTS sky train. 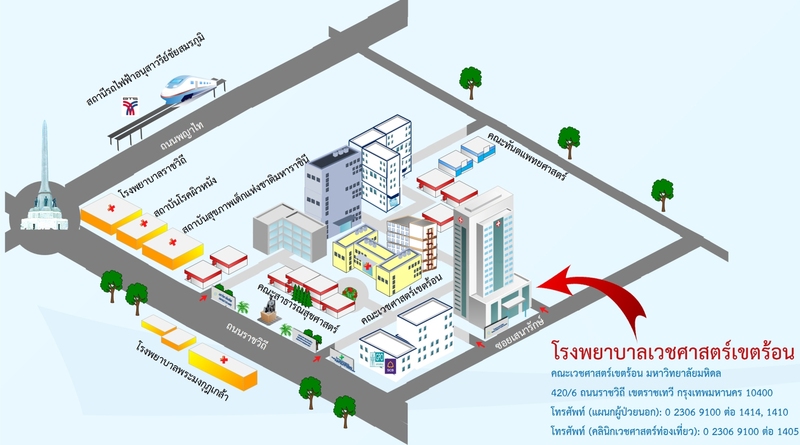 We have a detail map how to visit our clinic step by step from the BTS victory monument’s station. Please visit this page for more detail.